And they bore beautiful, perfectly ripened fruit, especially sweet and delicious consumed on the spot (or by the pool) in the midday sun of Mallorca, Spain. But, you don’t have to travel to Europe to get wonderful fresh figs. Thanks to the farmers in California www.Californiafigs.com and elsewhere, even seasonally in New England, these treats are available much of the year, the winter months being the exception. It wasn’t always this easy. Growing up, I remember thinking that the only way to find a fig was in a Newton, or, dried in a box. 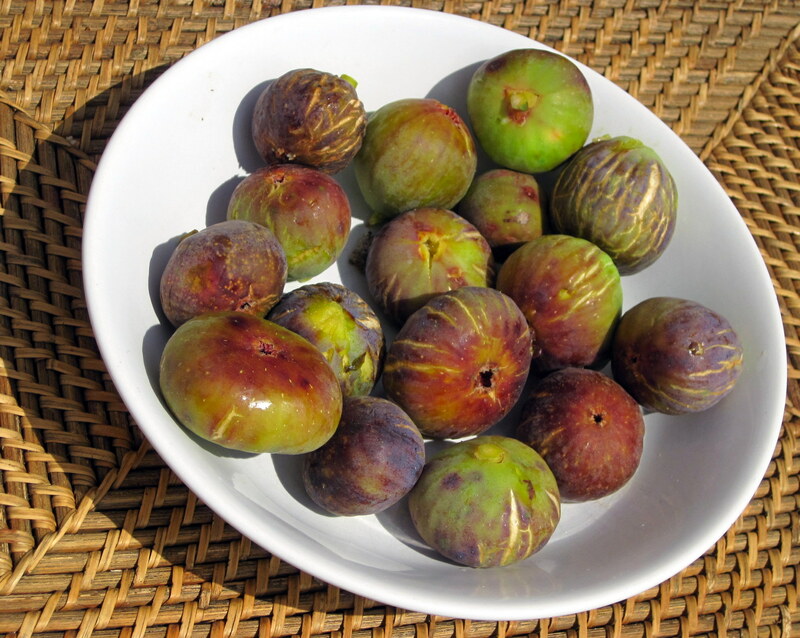 Not so long ago, at a book group with a bunch of otherwise worldly folks, I served fresh figs the evening we discussed The Fig Eater (Jody Shields), and several people had never seen them before, a shame, since they are easily obtainable and versatile. 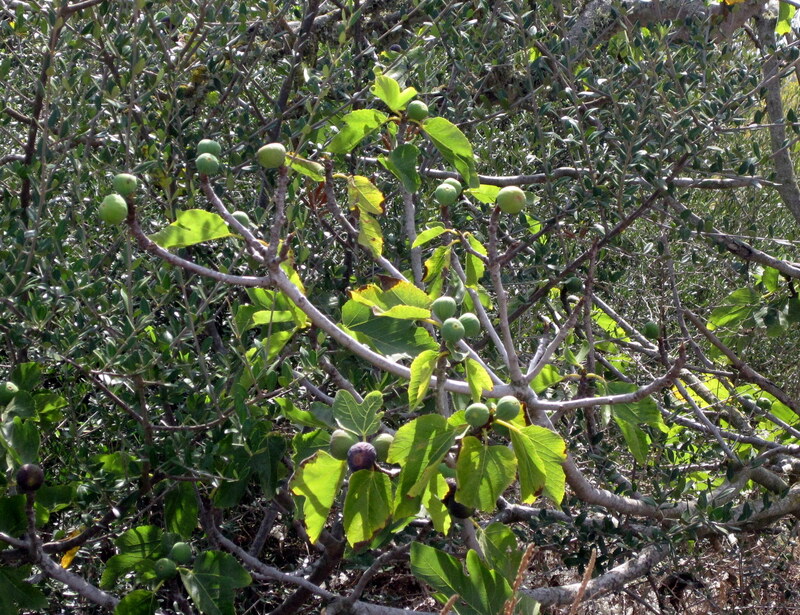 Figs, either dried or fresh, can be tossed into a salad, to make it extra special. Recipes abound for ice cream made with figs, either fresh or dried (different preparations, of course), both delicious in their own way. Dried figs are hardly a second class alternative, just different, making for a tasty, albeit caloric, snack, or substitute for raisins or other dried fruits in sauces and stuffing. They are the perfect garnish for a cheese platter, the sweetness being a counterpoint to robust flavors. Figs are native to the Middle East, where they are still used as a natural sweetener, and they are frequently mentioned in Biblical texts, with some scholars arguing that the “apple” was really a fig (whose strategically placed leaves appear frequently in religious art). The expression, “I don’t give a fig” won’t pass the censors, as it refers to an obscene gesture, much coarser than “I don’t care”, so myMEGusta suggests that readers don’t adopt it. But, have more figs in every other context! LOVE, LOVE this post. I love FRESH figs and was first introduced to them when I was taking cooking class in Piedmont in 2000. I am going to send you an e-mail with my fig story…. Excellent reminder about a delicious fruit. 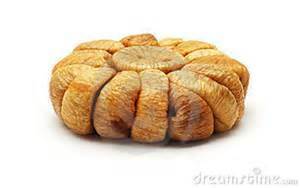 During my childhood in Austria dried figs were pressed into cakes resembling chocolate bars and used as coffee enhancer. The bars were scored and people broke off pieces and added them the brewed coffee. It made the coffee darker and slightly sweet. This custom goes back to the long relation of Austria with the Middle East. I don’t know whether “Feigenkaffee” is still available.